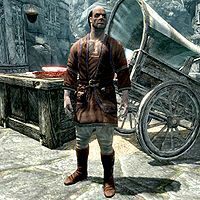 Hogni Red-Arm is a Nord meat merchant who spends his days running a stall in Markarth's marketplace, in front of the city's gate. Hogni wears a set of merchant clothes and a pair of boots. He is equipped with an iron dagger, and carries a selection of common loot and gold. On most days, Hogni gets out of bed at 6am. He'll then sit down and have a two-hour breakfast in his room at the Silver-Blood Inn. He then heads out to the market, at 8am, to work his meat stand for twelve hours. Then, at 8pm, he heads back to his room in the Silver Blood Inn, and hangs out there until he goes to bed at 11pm. When greeted, he'll try to sell you meat, saying, "Hey you. Yeah, you. Fresh meat for your stomach. ", "The bloodiest beef in the Reach. ", and "You want a cut of venison or mutton? Of course you do." If the Stormcloaks have taken The Reach, he may also say, "Stormcloaks or Imperials. Either way, all they want is everything for free and you to lick their boots. ", "Don't try to haggle with me. Buy or leave. ", "The secret to chopping meat is never washing your hands. ", "A man like me makes a lot of enemies. People are always trying to cheat me. ", and "I paid extra for the biggest room in the Silver-Blood Inn. I need space to stretch these arms." If you tell him you have some questions about Markarth, he'll say, "Do I look like a guide? Only thing I do is sell meat. Now, are you going to buy or not?" If you ask him where he gets his meat, he'll say, "Ah, now that is a good question. Where does Hogni get the finest, freshest meat from all over the Reach? The answer is simple. Orcs. There is a stronghold nearby whose hunters can butcher a deer in seconds. Now having an Orc for a wife would be something, yes. Strong and bulky. Too bad they don't let people go beyond the walls. Let me show you where they are. Maybe they welcome you. Maybe they put an arrow in your face. Who knows?" He'll now mark Dushnikh Yal on your map. When exiting conversation, he'll say, "Come back when you need more meat. Bring gold." and "Need to get back to chopping." Hogni: "You there, pretty lady. You need some fresh meat for your family? Just look at the blood coming from this cut...."
Hroki: "That's disgusting, get that rotting carcass away from me!" Hogni: "What's wrong? You have to look at the blood closely to see the quality of the meat. How else will you know it's fresh?" Hroki: "I don't need to know if it's fresh from this distance." Hroki: "Ugh. You're the most disgusting merchant I have ever seen. The guards should take you away." Hogni: "The only people I offend are cheats who don't pay me enough gold coin, or idiots who don't know good meat when I throw it at their faces." Hroki: "If you ever think of throwing meat at me, I will have you dragged off to Cidhna Mine so fast the guards will yank those filthy arms of yours off." Hogni: "What do I do to deserve such hatred? You give people good food and good prices, and all they do is insult you." "Hogni Red-Arm, more like Hogni Fat-Arm." Degaine: "Alms. 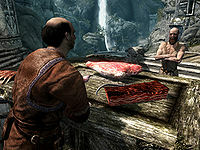 Give me some meat, you fat Nord!" Hogni: "What did you say to me, Reachman?" Degaine: "I said give me some meat. I'm hungry, and the Divines know you don't need more food in that huge gut of yours." Hogni: "You little twig. I'll snap you in two!" Degaine: "Just try it. Maybe a little time inside Cidhna Mine will get rid of all that fat on you." Hogni: "Look at you, begging on the streets. Learn a trade." Degaine: "Picking on me again, you backbiting Nord? Tired of those prissy nobles turning down your rotten slabs of venison?" Hogni: "How dare you. No one turns down cut meat from Hogni Red-Arm!" Degaine: "Hogni Red-Arm, more like Hogni Fat-Arm." During The Forsworn Conspiracy, when Margret gets attacked, he'll yell, "Guards! Forsworn!" If you go near Hogni, he'll say, "This has ruined my entire day." When you converse with him, he'll say, "Did you see that madman? A Forsworn agent. Here in the city." If you tell him you were looking to buy something, he'll say, "Didn't you just see that woman getting attacked in front of us? We're closed." If you ask him who Weylin was, he'll say, "Think he worked down at the smelter. Lot of the laborers there are sympathetic to the Forsworn. They promise people they'll kill off all the Nords that rule over the Reach. Nothing but murderers and saboteurs." Later in the quest, if you ask him about Margret, he'll say, "Who? You mean that woman who was attacked in the market? Didn't know her. Guards dragged her body away. Last we'll hear of that." However, if you saved Margret, he'll say, "Who? You mean that woman who was attacked in the market the other day? Don't know her. Guards dragged that Forsworn's body away, though. Last we'll hear of that." At the end of the quest, if you helped Madanach, he'll say, "Huh. Heard you broke out of Cidhna Mine with those Forsworn. Do you have any idea how many died?" 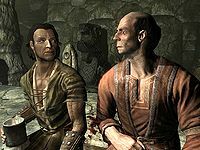 Alternatively, if you helped Thonar Silver-Blood, he'll say, "Can't believe anyone was dumb enough to mistake you for a Forsworn agent." Eola: "Thank you for coming to dinner, Hogni." Hogni: "I never miss a good meal." Hogni: "The toes are my favorite part. I hope I get to take a few home with me." Lisbet: "I always preferred the liver myself. My brother had such a juicy liver." Afterwards, if you see him back in Markarth, you can remark that he was at the feast, to which he'll say, "Don't go talking about that. Only the dinner guests can know." Some game data refers to Hogni as Boli. This page was last modified on 11 June 2017, at 13:24.